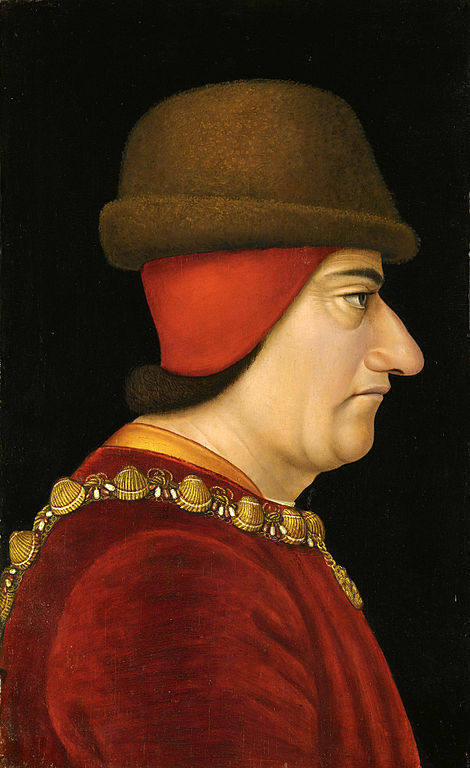 Louis XI, son of Charles VII, was a king of France from the Valois dynasty that had replaced the Capetian dynasty a century earlier. A schemer whose reputation in history was solidified when Sir Walter Scott condemned him a century later, Louis was nicknamed “the Spider King” for his weaving of webs of intrigue. At age 16, he tried to overthrow his father, Charles VII. The so-called Praguerie—Prague had been the site of similar uprisings—was the second such led by the duke of Bourbon, as the nobility sought to remove Charles from power and replace him with Louis, in response to Charles’s limits on noble power and reforms increasing the power of the monarchy. When the revolt failed, the major participants, including Louis, were forgiven after their surrender and submission. Six years later, Louis was sent to the province of Dauphine to govern and never saw his father again. They continued to plot against each other, and Charles even sent soldiers to retrieve Louis in 1456, but the prince was given shelter by Philip the Good, duke of Burgundy. Charles died five years later, and Louis succeeded him at the age of 38. Two Charleses—Louis’s brother the duke of Berry and Normandy, and Philip’s son Charles the Bold—led a revolution against Louis, each motivated by the desire to expedite his inheritances and seeking Louis’s removal in the name of breaking down the centralized authority of the French monarchy. Like Louis’s rebellion against his father, it was unsuccessful—and like the aftermath of that rebellion, the participants were forgiven after submitting to the king’s authority. Louis was the king of France during England’s Wars of the Roses, and since the rebel Charles the Bold was an ally of the Yorkists, Louis supported the Lancastrians, even manipulating events in order to force France’s Yorkist king Edward IV into exile. When Edward was restored to power, Louis prevented his planned retaliatory invasion of France by relinquishing any French claim to the English throne—which became another bone of contention between the king and the nobility. When Louis finally decisively defeated Charles, there were no pardons this time—the rebel was killed in battle and many of his noble supporters executed. Louis strengthened the monarchy, further limiting the powers of the nobility even as he granted more power to common-born merchants. Though he was poorly remembered, France prospered under him—prosperity it lost under the reign of his son, Charles VIII, a pleasant-natured man called Charles the Affable whose bumbling led to mounting debts, ill-considered wars, and treaties that put the kingdom at severe disadvantage as the Middle Ages waned.